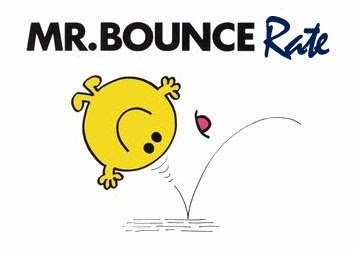 In this article I’m going to discuss how can we interpret the bounce rate on our website? Is it something bad? How to interpret it in Google Analytics? How to reduce the bounce rate? Is the main metric of the Web Analytics? Web Analytics, SEO and Online Marketing in general, today I bring you the answer to all your questions, and like many, I'll quickly summarize through my experience the different aspects. 1. What is Bounce Rate? 2 Is Bounce Rate Bad? 5 Is the main metric of the Web Analytics? The bounce rate of a web is quite controversial, but must be understood as the user does nothing when it comes to Web and leaves. The ability of our website users to engage directly related to the content they are visitors. This is the percentage of single page visits to total visits, that is, those who enter and leave. As we see is very simple and easy to understand, but not to interpret. 2. Is Bounce Rate Bad? If our website is a blog, the bounce rate is always much higher, and therefore not a negative indicator. This occurs because blogs usually have many returning visitors (loyal users who have read the article and as others have already read, just read it and go ) or because the user finds what they need and leave. It is therefore crucial to assess the type of site you are analyzing. It may be that the user lands on the content that is demanding and does not need to make a second click , such as simple local business websites where the user just looking for the phone number or address. The bounce rate would be bad if we bring traffic from campaigns and when the visitor lands on our Landing Page takes no action (form filling, etc.) and leaves. Therefore it is vital to make a good bounce rate analysis segmented by traffic sources, campaigns, keywords. Only on this basis can we tell what is working and the need to improve our site. By default Google Analytics bounce rate is taken as the user moves from page no. This is so wrong because, as we said earlier, a blog could get to have a bounce rate from 80% to 90%. It is also important that if we use Google Analytics, well as the actions we consider events as it does not take as Google Analytics bounce rate when a user takes some action that we have configured this way. Reduce bounce-rate-The internet user is very impatient with speed and need to satisfy your concern. It is widespread in the Web sector 7 are the maximum seconds that a normal person dedicated to exploring the home of a website in search of something interesting, before deciding to leave. How does it affect the data? If this is a corporate website, where conversion is at several clicks of the main landing pages, we analyze which are the aspects to be improved to lower the bounce rate It is therefore very important to keep trying different versions and creative’s. We can also reduce the bounce rate if we will decrease load times, yeah, you heard right, the load time of a web page affects the bounce and conversions. In blogs for example to reduce bounce rate we could help the user to navigate between different items, such as putting related posts items, make a list of the best easily accessible articles, etc. Showing the user information request page where you land, avoiding excessive noise and including the possibility of contact or action required to reach will increase our conversions, but will also increase the bounce because the user does not advance (miss a second click ). So if each of our pages inserts a form and a contact telephone number, the user may not make a second click, but end up becoming. In the case of placing a form on our website's home company or product pages, bounce rate will increase depending on how it is configured tool web analysis. For Google Analytics, if we mark the form submission as event, this would not be considered offensive. This is just a technical question, but what is certain is that with a form on the home page and product conversions will increase considerably. 5. Is Bounce Rate metric main Web Analytics? Is a leading web analytics metrics performed well because we like it says to you or find what you want, that is, it is a metric that indicates the level of user satisfaction. For me particularly is a good indicator when I analyze the bounce rate of my organic keywords and so to measure and correct the quality of my SEO campaign. In short, the interpretation of the bounce rate will always depend on the type of site we analyze. As a SEO Consultant, for me it is a metric that helps us to measure the quality of our traffic. If we want to reduce it should be corrected if we slow pages if users orient well to what we want, whether on a blog encourage you to read other articles. While writing this article I came across Revbuilders Marketing that will establish your position on the Internet and keep you at the forefront of your industry.